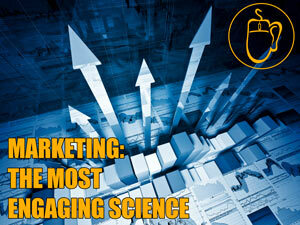 Marketing is the most engaging science. Your lab is the market. Your reagents are people and promotion. The reaction you’re trying to synthesize is getting people to respond to promotions. The reaction is about changing minds towards a goal. Marketing is the science of leveraging ideas and their expression towards getting response, a plenum for testing hypothesis against real human behavior. Marketing rewards you generously when you’re right and punishes you mercilessly when you’re wrong. If you’re a college student who wants to practice science, develop hypothesis and test them out for practical purposes, not just some abstract theory disconnected from everything else, then Marketing might be the area for you. If being an extrovert, a people person, is what’s keeping you out of the lab, keeping your hands dry, then consider Marketing. It’s got all the data with less of the yuck. Plus your co-workers are going to be a lot better looking on average. There are rewards that can be seen, heard, felt and tasted. There’s that reward of making the crowd jump, jump. Marketing is science made sensual. Try that in the lab. I’ve been drawn to Seth Godin’s observations often. He’s an author who focuses on the qualitative aspects of marketing performance. There’s a lot of that type of advice you’ll get from marketers, qualitative advice. Seth is wonderful at analyzing, labeling and pigeonholing what’s important. What really get’s me off is the quantitative stuff. I love working with the numbers, because the yield of a data set is greater than the sum of it’s parts. In addition to the raw data collected over time, the discrete individual points, there’s a world of analysis that can be applied and yielded. You can look at a raw data set in different ways to draw different conclusions from it, yielding more data points than the raw data set originally contained. Real world problems, business problems, performance challenges arise when you’re a marketer. It takes a marketing scientist to recognize the problems for what they are, analyze them, and synthesize real world conclusions and solutions. Then the application of those solutions yield another data set. The world of marketing is like heaven to a scientist, a cornucopia of data sources and challenges waiting like treasures to be discovered. Your analysis or this article is nuts. The people that put this together never sold anything to anybody. They churn numbers and think they came up with stuff. You start with the marketplace and go down to the actual possible user of what you are selling. You find out what is their selection criteria for buying say a bug spray. Numbers won’t tell you anything.